First Novels Club: Blog Awards and Come Along Contest Winner!! Thank you so much Nikki at Ramblings of a Bibliophile for our second ever award! WOOT! We are so honored to have recieved the One Lovely Blog Award. The rules: Accept the award, post it on your blog together with the name of the person who has granted the award, and his or her blog link. Pass the award to 15 other blogs that you’ve newly discovered. Remember to contact the bloggers to let them know they have been chosen for this award. 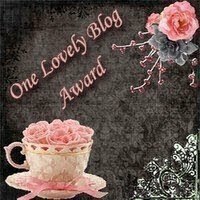 So now we must pass this lovely award onto 15 other lovely blogger! No easy task because we love so many of you, but here we go! Thanks again Nikki and congrats to all our award winners. Yay! Allison we sent you an email! Thank you everyone for participating and vicariously coming along for the ride of our adventures.And just so you know, Allison had three entries so those extra little points really do help! Stay tuned. We've got a few more things up our sleeves. Congrats Allison, and thanks so much for the award Frankie! You and FNC run a very lovely blog indeed. Thanks for the award! Congrats to Allison! Thanks so much for the award! Congrats to you too! Congrats Allison! Yay! Thanks so much for the blog award! And congrats to Allison! Thanks for the award! And the one you gave me while I was in Kenya. I did check it out while I was there, but I didn't have time to leave a thank you. Thank you so much for the award. I'm honored.